Carl Frampton's stunning second-round win over Hugo Cazares is hailed by his sports star friends David Healy and Paddy Barnes. The 27-year-old Northern Irishman, ranked second in his weight division, put Mexican Cazares on the canvas with a left hook at the Odyssey Arena in the WBC super-bantamweight title final eliminator. 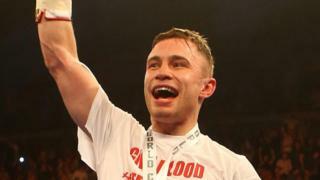 Frampton is now on course for a world title bout with WBC champion Leo Santa Cruz later this year.